The US troop withdrawal from Syria will not be scuppered despite Turkish threats against Washington's Kurdish allies there, Secretary of State Mike Pompeo said on Wednesday, promising to ensure that the Kurds would still be protected. Pompeo has the task of explaining US policy in the region after Trump's announcement of the withdrawal of all 2,000 US troops from Syria, which rattled allies and came as a shock to top US officials. Defence Secretary Jim Mattis quit over it. The US forces have been working with a Kurdish militia to fight against Islamic State. The Kurds control a swath of northeastern Syria, Washington's foothold in a conflict that has drawn in Russia, Iran, Turkey and other regional powers. Washington has repeatedly said its Kurdish allies will remain safe despite the withdrawal. But Turkey, which considers the US-backed Syrian Kurdish YPG militia an enemy, has repeatedly vowed to crush the group and repudiated any suggestion of protecting it once US troops leave. Turkish President Tayyip Erdogan denounced visiting US National Security Adviser John Bolton on Tuesday for suggesting that protecting the Kurds would be a pre-condition of the US withdrawal, a suggestion Erdogan called "a serious mistake". Asked in Erbil if Erdogan's pushback on the protection of the Kurds puts the withdrawal at risk, Pompeo told reporters: “No. We’re having conversations with them even as we speak about how we will effectuate this in a way that protects our forces... "It's important that we do everything we can to make sure that those folks that fought with us are protected and Erdogan has made commitments, he understands that," Pompeo added. Smooth over relations The withdrawal of US forces in Syria strengthens the hand both of Turkey and of the Syrian government of President Bashar al-Assad, which is backed by Russia and Iran. Pompeo has stressed throughout his trip to the region that Washington still aims to counter Iranian influence. In Iraq, Pompeo also sought to smooth over relations after political leaders were angered when Trump visited US troops on the day after Christmas at a remote desert air base without stopping in Baghdad or meeting any Iraqi officials. President Salih, answering a reporter's question on whether he wants the United States to keep troops, said Iraq "will need the support of the US" and expressed his "gratitude to the US for support over the years". It now has around 5,200 there, and Trump has not announced plans to pull them out. Asked on Tuesday about what would be discussed during a possible meeting with Pompeo, Abdul Mahdi said deepening Iraq's relationship with the US-led coalition fighting Islamic State. 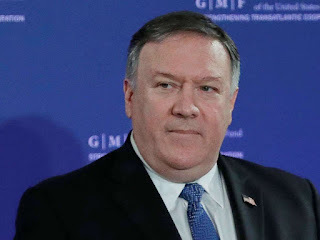 "He's an ally, he represents a friendly country," Abdul Mahdi said of Pompeo on Tuesday. "We will raise those issues, and how to deal with regional issues altogether and deepen our economic and educational relations with the United States."